Finding homes for new staff coming to Ireland is a "huge problem", according to the head of drug maker Mylan in Ireland. But that could boost the regions as the company will look at locating future manufacturing jobs outside the capital. "On that corridor between Galway and Dublin there's plenty of places that you would be able to put manufacturing, and people would be able to travel out rather than in - and that's what we are doing," says Owen McKeon, Mylan's country manager for Ireland. The company employs more than 1,400 people in this country, including in a large factory in the Galway Gaeltacht. That's in line with the Government's aim to boost regional jobs. Drug manufacturing plants are ideal because they are more self-contained than, say, a services business which might want to be in Dublin to network with potential clients. There are advantages for Mylan in being in Galway too, because it means the company is close to NUIG, with which it's in partnership. "You get very smart intelligent people coming out of there... people want to work in the West and stay in the West, that's an ideal position," McKeon says, adding that the business works with the IDA to try and meet the State FDI agency's goals. Mylan has facilities in the greater Dublin area too, at Damastown just over the Meath border, and also in Baldoyle. That means that it has plenty of experience with the housing crisis, the "huge problem" McKeon describes. Mylan is best known for making generic versions of drugs with expired patents. One of the big business opportunities it sees in Ireland in 'biosimilars'. These are copies of so-called 'biologics', complex medicines that differ from an everyday drug in that they cannot be simply manufactured in a lab, but rather are made from living entities like plant cells or animal cells. One biologic that's just come off patent is Humira - used to treat a number of diseases including psoriasis, ulcerative colitis, Crohn's disease, and arthritis. Mylan has the ability to produce that as a biosimilar - along with at least four competitors. McKeon says legislation is needed to increase the uptake for biosimilars, which in turn should reduce costs (as well as boost Mylan's bottom line). But he's grown exasperated with a Government decision-making process that he thinks is too slow. "We're giving them an opportunity to cut down on their bills. If anybody came to you and said: 'I can cut your bill by 40pc-50pc', and you said: 'Hold on, I'll go away and spend 18 months consulting and I'll come back to talk to you then', you'd be classed as mad," he says. "But that's where we are the moment." McKeon says the Department of Health is to blame. They've been working on a 'National Biosimilar Medicine Policy' since at least last summer. An article on the Department's website dated August 10, 2017 says the policy would "promote the rational use of biosimilar medicines and to create a sustainable environment for biological medicines in Ireland", adding that biosimilars "are typically less expensive to produce than the reference medicine, due to lower research and development costs". "As a result of the lower costs and competition for market share, they are generally priced at a significant discount to the reference medicine." Fifteen months on, the policy is still not finalised, with the Department telling the Irish Independent that it is considering the responses to a consultation on the strategy, as well as "other possible policy levers". It said, however, that the HSE is running a separate biosimilar strategy in its acute hospitals drugs management programme, and that this is "making considerable progress using a collaborative approach led by hospital pharmacists". It did not give a specific answer when asked when legislation will be introduced. Another source of frustration for McKeon is Brussels, where manufacturing rules are depriving Europe - and Ireland - of jobs, he says. As of now, generics manufacturers cannot start making a drug in the EU until a drug has come off patent. That, McKeon says, has had the effect of benefiting other countries, where the drug can be manufactured and stockpiled before the patent expires, and then sent out to market as soon as the time comes. "Everybody outside the EU can start manufacturing when they feel like it, and on the day when the patent goes off all the product can come in. "We're actually shooting ourselves in the foot with this and that's one thing that we push really hard on, saying they need to get rid of that. "We're not going to start selling before the patent goes off but we just want to have the ability to [be ready to go on day one]," McKeon says, adding that some of that new manufacturing could come to Ireland. Mylan likes being here, he says. It likes the education system, the access to markets, and even simple things like the location between the US and Asia which means the time zone is convenient for dealing with various parts of the world. He reports into Mylan's regional division, which covers Europe - a rapidly expanding part of the company which has seen turnover go from $1bn to $4bn since purchasing Meda. That's meant much more focus from head office in the United States. Despite President Donald Trump's drive to bring US jobs and profits home, Mylan's plan for Europe and Ireland hasn't been affected, McKeon says. "The vision that Mylan have about coming to Europe and growing the market is still there, that hasn't changed at all no matter what Trump says. "I mean he has repatriated some of the profits - to be honest that doesn't affect us [in Ireland] because that's sitting somewhere else, that's sitting in some treasury in Holland or somewhere," McKeon says. Another potential threat to the Irish operation is of course Brexit, and all the potential disruption that new customs arrangements would entail. McKeon says his business and others are working with the health authorities to identify any potential medicine shortages. He says the company doesn't have much products coming out of the UK, but some does come through Britain to Ireland and this might require changing logistics arrangements in order to take account of any potential customs delays. "We should be OK and the country should be OK," he says. Less of a threat and more of a challenge is changes in the way drugs are being prescribed," McKeon says. "If you look at some of the stuff that's being developed from an AI point of view, from a diagnostic point of view, you could have people in Germany diagnosing your diseases," he says, referring to online doctor services like, for example, Irish firm Videodoc. But despite being a "drug producer", as he puts it, for the last 40 years, he believes Irish people are too reliant on the pharmaceutical industry. "We are not taking responsibility for ourselves health as a nation, we don't really do that. We think there's a pill for very ill. Although I've been a drug producer for 40 years I don't believe there's a pill for every ill.
"And we are becoming very dependent on health support for all sorts of things ... a huge amount of education needs to be done." McKeon began his career as a pharmacist, but quickly moved into the drugmaking side of the industry, joining a business called Knoll. 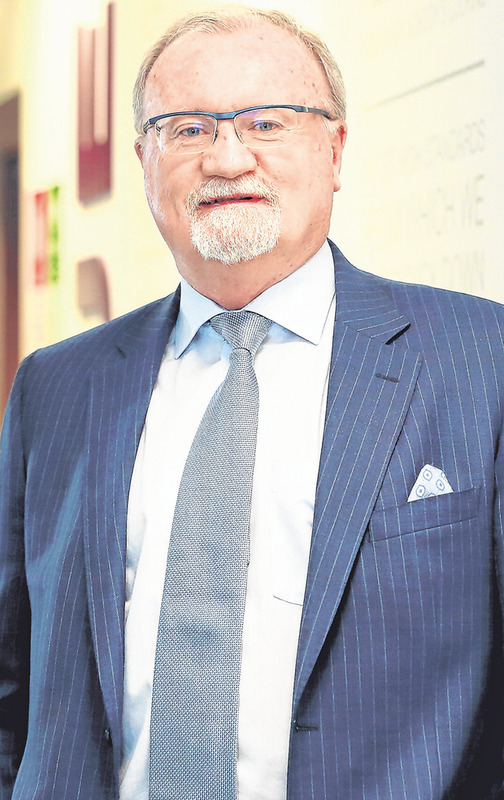 He worked for a number of different firms before eventually setting up the Irish subsidiary of a Swedish company called Meda, which grew strongly over a 10-year period. "I was managing the UK and Ireland for Meda up to three years ago, and then Mylan bought us out and they said: 'Look we're a big entity in Ireland and we need somebody to come back and run Ireland'. That suited me fine to come back home rather than doing that commute over and back to Stansted. So for the last two-and-a-half years I've been back managing Mylan over here." Having worked across a number of areas in a pharma industry career, from finance, to marketing, to regulatory affairs, he says sales is the hardest role of all. Nevertheless that's what he sees his key function as: managing and motivating Mylan's Irish sales team in selling the company's products to pharmacists and medical providers. But regulatory affairs is becoming more and more important, which is probably a factor behind his outspoken comments on this country's biosimilars strategy. How much longer he'll have to wait for the business opportunity to properly manifest itself is anyone's guess.